What is Pongal Dish ? The most important part of the Pongal festival is cooking the Pongal dish. A sweet version of pongal called Sakkarai pongal is made with rice mixed with moong dal and cooked with ghee, cashew nuts, raisins adding jaggery (a type of unrefined sugar). 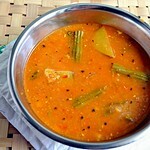 A spicy pongal called Ven pongal/Ghee pongal is also prepared adding lots of ghee and spices like pepper & cumin. Traditionally, pongal is cooked in clay pots, on stoves made with stones and wood used as fuel. When it starts to boil over, everyone shouts out "pongalo pongal". Usually we make Sweet pongal, white pongal/paal pongal, Sambar with 7 vegetables, Poriyal or kootu, Thayir pachadi, Paruppu/dal along with Vada, Suzhiyan & adhirasam. 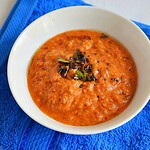 Click HERE for Pongal recipes collection. 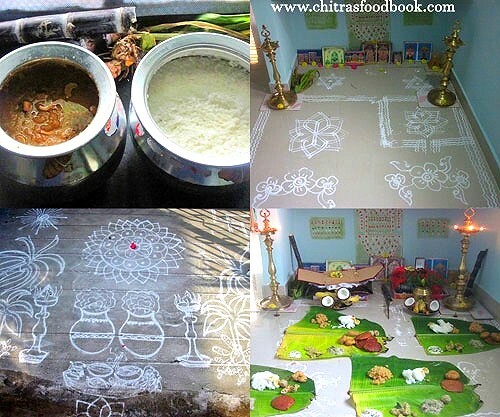 Visit my in-laws blog for kolam ideas. On bhogi day, wash and clean the entire house. Clean doors, windows & keep turmeric, kumkum dots. If you have the practice of burning old things, you can do it on this day. We used to discard the old clothes. Wash all the blankets, pillow cover, screen cloth. Wash the lamps and other pooja vessels. Decorate it and keep it ready for next day pooja. If using clay pot & stove buy them. If using cooker or brass pot, wash and keep it ready. Tie the manjal kothu around the pot. Draw three lines with wet viboodhi (pattai) and keep a kumkum dot on the pot. Buy all the required ingredients for cooking & pooja on this day and keep everything ready. On bhogi night, after finishing the dinner, clean the gas stove and draw three lines using viboodhi(viboodhi Pattai) and place kumkum dots on all the sides of gas stove. Refer picture to get the idea. If you have the practice of making suzhiyan, adhirasam and obbattu/ poli, prepare them and store in a box. 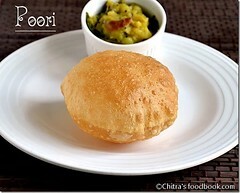 Soak the urad dal & grind vada batter. Refrigerate it over night. If you wish, you can wash the entrance and draw the rangoli too.The next day morning, you will be having enough time to make neivedyam recipes and perform pooja quickly. Clean the pooja room and draw a rangoli in the place where you are going to spread the banana leaves for neivedyam. 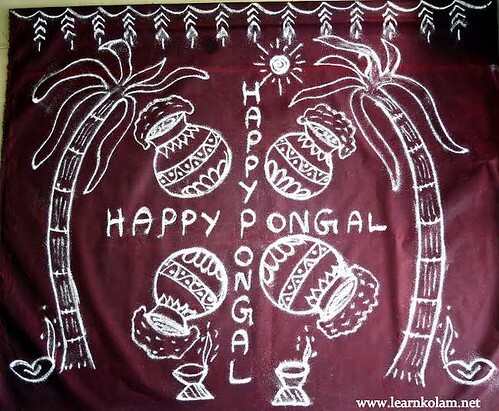 On Pongal day, wake up at early morning 4am because we are supposed to do the pooja during sunrise at around 6am. So wake up early and take head bath. Some people make pongal at the auspicious time of the day. So you can plan accordingly. 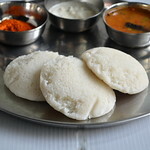 First make sambar, poriyal/kootu, pachadi and paruppu. Keep everything aside. It takes 45 minutes including chopping & cooking if you have two cookers in hand. My mom keeps pongal in our backyard by using stone stove and brass pot wheras my MIL keeps pongal in gas stove. She uses brass or silver pot. So make pongal according to your family practice. 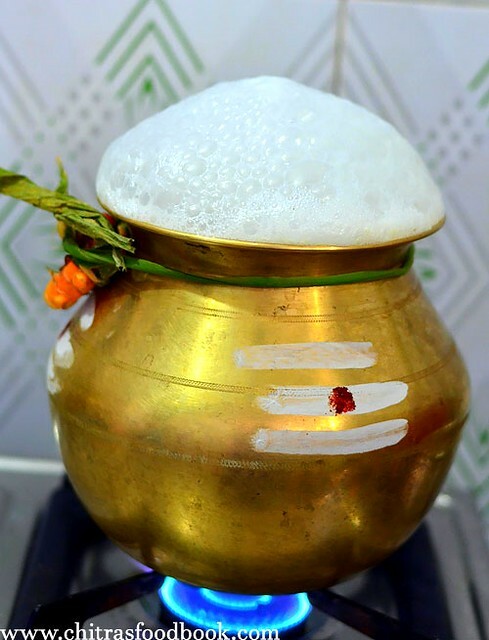 Now keep the brass pot ( please refer THIS POST if you are making pongal in pot) or cooker ( Refer THIS POST for cooker). 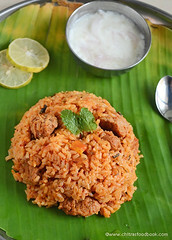 Make sweet pongal and paal pongal. 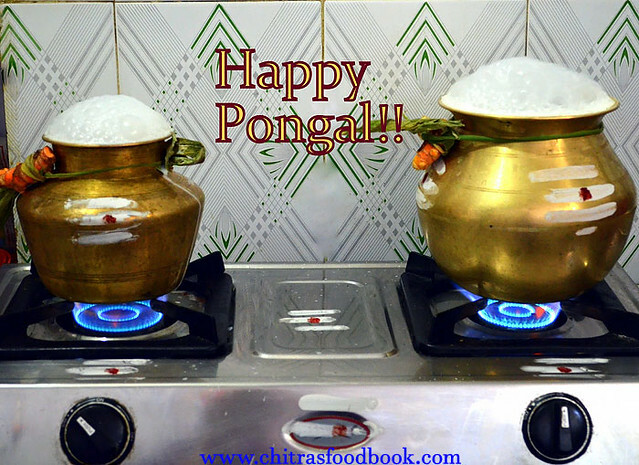 When it starts to boil over, shout out "pongalo pongal". Pray for your family’s well being and prosperity. After making pongal, keep it near the pooja room. Make the urad dal vada at the end to maintain crispness. Now everything is ready for pooja !! Generally Pongal neivedyam is for Sun God. But we do it for our Veetu theivam, Maga maayi and Sun God. So we have offered all the dishes in 9 leaves. But in general, spread 5 leaves for Sun God. In those 5 leaves keep sweet pongal, vella pongal, pongal sambar, 7 kai kootu in little quantity. Light two lamps in front of the banana leaves. Spread a banana leaf and keep all the seasonal vegetables like sweet potato, pumpkin, yam, arbi, panag kizhangu. Keep sugar cane pieces, banana, betel leaves & nuts. Break a coconut and keep it. Fill uzhakku (rice measuring pot) with rice. Now do the pooja and mangala harathi. Finish the pooja. After the pooja, my mom distributes a glass of milk sweetened with jaggery. We call it as “siruveetu paal”. It tastes really yummy and we love it. If you wish, u can make it too. For that, make jaggery syrup and strain it. Add boiled milk to it. Add crushed cardamom. 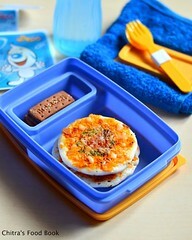 Mix n serve ! 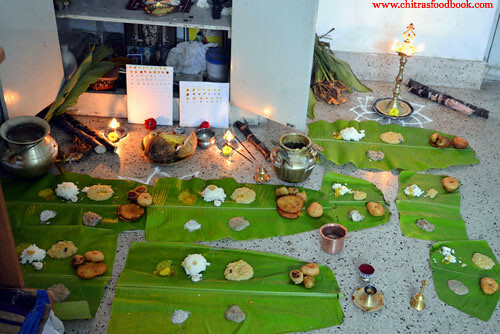 To make a simple pooja, just spread two banana leaf in the backyard/ terrace or pooja room. Light two lamps on both the sides. Keep the vegetables on the banana leaf. Keep a uzhakku fill of rice. 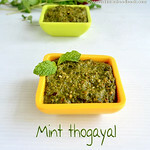 Place the coconut, betel leaves and nuts. 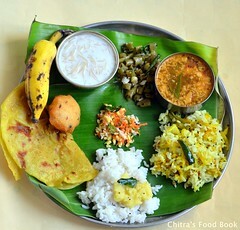 In another banana leaf, spread the cooked sweet pongal, paal pongal and seven vegetable kootu. Offer to Sun God and do the pooja. Aditya Hridayam or Surya Ashtotaram or Gayatri mantra can be recited Or you can simply mediate and say some simple prayers. After the prayers, some water and flowers are sprinkled on the kolam and pongal dish. 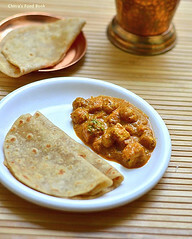 You can also sprinkle some uncooked rice mixed with turmeric (akshata). After final prayers, pongal & other dishes and fruits are distributed. In some regions, there is a ritual to look at the Sun’s reflection in a vessel filled with water. Some communities add turmeric and kumkum to the water and look at this reflection. Another unique ritual is to look at sun through the gaps of fingers. Great and informative post. Thank you. Thankyou dear.. m looking for same... Will try to follow. Great.. very informative post. 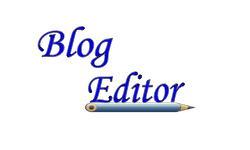 All Ur posts help a lot to me. Thank you.